Host Europe Review 2019: Is Host Europe a Good Hosting? Host Europe is a subsidiary of GoDaddy and has been providing web hosting services for over two decades. Its plans offer robust storage and solid features. However, its “free domain” offer is a bit of a bait and switch. Host Europe has been providing web hosting services since 1997 and over the years grew to be a full-service hosting company. GoDaddy purchased them in 2016 and the company continues to deliver solid solutions for website hosting. Host Europe has data centers in Spain, Germany, and the United Kingdom and serves nearly two million customers. 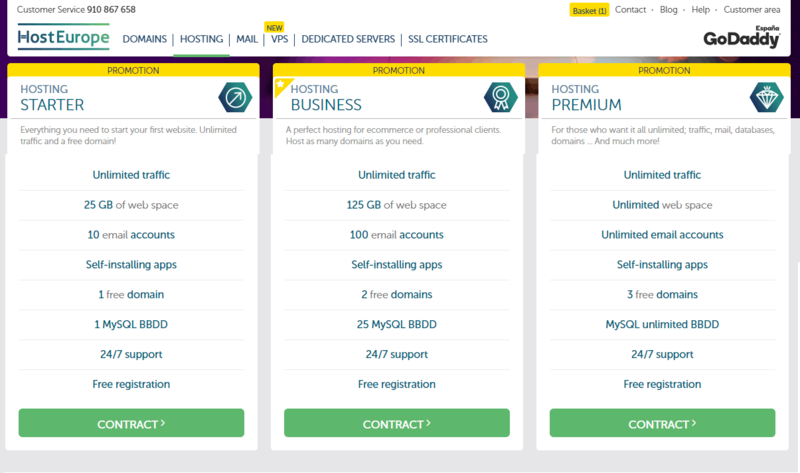 If you purchase Business or Premium hosting, you can host multiple websites. Premium even offers three free domain registrations. All plans support PHP 7, Ruby, Python, CGI, and Perl. You also get ten or more email accounts with 2 GB of storage with each account. Additionally, Host Europe’s email system supports mailing lists, which is something many hosts don’t allow. Host Europe is relatively easy to use, but keep in mind that its cPanel and systems are in Spanish. If you speak the language, there shouldn’t be any problem — otherwise, however, it may be best to look elsewhere. The company recommends that you have at least basic hosting knowledge, but it does offer auto-installers for WordPress and other programs. For everyone else, cPanel is available, albeit in Spanish. Host Europe offers very affordable service plans. Whether you pick Starter, Business, or Premium, you’ll find its prices lower than comparable offerings from other hosts. However, pay close attention to the terms of service. First, the Starter plan only offers terms of one, two, or five years. Other plans offer monthly and quarterly billing. Also, be careful about the “free domain” listed in the features. To get a free domain, you must already have a domain and associate it with your account. Only afterward can you use your coupons to redeem additional free domains. If you don’t already have a domain, you must purchase a domain registration when signing up. Host Europe offers strong support with 24/7 phone support along with live chat support and email support. It also has an extensive help section covering everything from domain setup to managing WordPress apps and more. I contacted support on a couple of different occasions with different results. Chat support is not 24/7. The first time I contacted them, I was forced to send an email, and while the reply was prompt, it seems that the agent was not able to fully understand my query. A couple of days later, I contacted support through live chat and got an agent immediately. He was able to answer my question quickly. While support is solid overall, live chat should be 24/7 along with phone support — or at least have email agents a bit better trained. Host Europe offers excellent features for its shared hosting products along with solid support options. While I am not happy with its bait-and-switch tactic regarding free domains, it’s still worth checking out if you plan to transfer a domain, plan to host multiple domains, or don’t mind paying for your initial domain. Sign up for Spanish-based hosting with Host Europe. Wondering how Host Europe stacks up against other Web Hosting companies? Enter any other Web Hosting company and we will give you a side-by-side comparison.